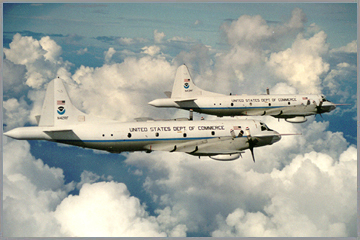 NOAA's Aircraft Operations Center at MacDill AFB, FL maintains and operates NOAA's aircraft assets. Among them are two Lockheed WP-3D Orion, four engine turbo-prop aircraft, which are mainly used for severe storms and other weather related research. Starting in 1994, these aircraft have been temporarily converted into highly sophisticated airborne air chemistry and aerosol research platforms. Fairbanks, Alaska is the best location near Barrow for operating a large aircraft such as NOAA's WP-3D. The WP-3D has the appropriate range, endurance, altitude capability and payload for these investigations. This aircraft is capable of operating safely in the demanding Arctic environment while performing multiple vertical profiles, long-ranging horizontal transects, and low-altitude sampling. With > 8-hour endurance, a WP-3D can fly from Fairbanks to Barrow and conduct more than 4 hours of research in the vicinity before returning to Fairbanks. The horizontal legs from Fairbanks to Barrow can provide additional information regarding the latitudinal gradient in aerosol properties across the mean position of the Arctic front. Operational range is an estimate and actual range is determined by how much fuel can be loaded within the maximum aircraft gross weight limit of 135,000 lbs. We anticipate the aircraft to be 'max zero fuel weight' limited, i.e., with the fuselage loaded to capacity and additional instrumentation operated in external stores (pods) under the wings. The WP-3D aircraft are operated by an AOC crew of seven (aircraft commander, pilot, flight engineer, navigator, flight director/meteorologist, and two technicians) and can carry in addition several science personnel. The planned payload relies on the full space and payload weight capacity available.